Good Morning, having attended the Crane Supervisors course last week I must thank everyone at Ainscough Training for firstly making me feel very welcome and secondly delivering a brilliant course. I would like you pass on my thanks to Owen as he got me through the course without dropping a mark on either test. Ainscough Training came strongly recommended to me and didn't disappoint. Once again thank you all. After achieving on the A61 Appointed Person course I would just like to say a massive thanks to both Jim and Steve. Throughout the week the course content was delivered thoroughly and Jim always made an effort to ensure all participants had understood the content, answering all questions of uncertainty. Steve was the invigilator for the test and his relaxed approach puts you at ease. The feedback noted is great to receive also as it allowed me to see the areas that can be improved. The training facilities at Ainscough are fantastic and I would definitely recommend you for any courses offered. I look forward to completing my NVQ with yourselves. Im writing today to say how much of a pleasure it was to attend the Ainscough Training Services.Your reception staff were fantastic with excellent background knowledge on how the Enhanced Learning Credits Scheme (ECLAS) system works for military personnel leaving HM Forces. I found the prices to be very competitive for the level of training received and will insure I recommend Ainscough training to friends and other work colleagues. I completed and passed the following courses with Ainscough - Slinger/Signaller A40, Mobile Crane A60, Appointed Person A61 and found all your instructors to be very professional and helpful throughout the training. Thank you once again, and I will be sure to complete my NVQ with Ainscough in the future. Graham Gilligan is a fantastic communicator. Very clear and precise in how he presents and projects himself. Everything was explained clearly, I knew what was asked of me and understood what was expected from me during the training. Armed with the knowledge from Graham and into the pit of death AKA 'the theory test' with Owen smith, my nerves just wouldn't settle. Owen is a cool calm guy obviously used to sleep deprived novices that stayed up all night studying. He really helped with his calm and to the point demeanour that helped me to focus. Dave and Keith the two Crane Operators I came across on the course where great to get along with and made the experience even more friendlier. The practical assessor was fair in his assessment and again a warm reception that just helped to settle my nerves and helped me to focus with the task's. Along with getting on with the Managing Director it was clear that Ainscough Training set the example for how a company should be set up.I really enjoyed my time learning and all the staff I interacted with are a credit to the company, especially the Chef' who catered to my vegetarian diet exotically well. I want to pursue future training and I want it to be with Ainscough Training due to this experience. Hopefully one day in the future I could also be a happy and proud employee of a company such as Ainscough Training. "Hi Richard, I have been in touch with Steve Barnes recently about how he got on with you doing his Lift Supervisor NVQ. As you may remember, we switched him from a course he was doing with another supplier actually already based on our previous experience of you being reliable and reputable at supporting the men in getting through it. He has asked me to put together a letter (or email!) of thanks to you, saying that his tutor, Joe, couldnt have been more helpful. Steve said the sessions he had with Joe were time efficient and didnt prevent him from doing his day job, he was clear on what he had to do, and the whole thing was a good learning experience from start to finish.It is really tough for our men to do their day job, pass an NVQ and then apply it, and it is equally hard for me to try and juggle the front office work with men, NVQs, touch screen tests, card applications and life generally, so when we have a company that the men enjoy working with, are efficient and reliable and support me by owning the whole process from start to finish it really makes things much easier. So on behalf of both myself and Steve, thank you and would you please pass Steves thanks on to Joe." "Can I just say a massive thanks to Gary Waddoups who was the instructor on the AP course. It was excellently presented. Gary made every effort to ensure everyone understood the course content at all times. It is one of the best courses ever done. Thanks Gary. I would also like to say a big thank you to Steve Turner who was our invigilator for the test on the Friday. Steve has a great calming influence which is welcomed when doing the examinations. He was very helpful and he took the time on the Sunday to phone me to let me know I had passed the course which was really appreciated. Many thanks Steve. It was another example of the great level of service/training you offer at Ainscough. The training facilities are absolutely fantastic the best seen and the atmosphere and attitude of everyone at Ainscough training is brilliant. Everyone I met was really helpful and friendly. A fantastic set up you have at Ainscough training from facilityto staff. I really cant say enough great things about Ainscough training and thank you all for making the training experience an enjoyable one. I look forward to completing my NVQ with Ainscough Training". "I have never been to a friendlier and more welcoming training centre; the instructor was humorous with a broad knowledge of the subject. A very clean, comfortable venue with a friendly helpful and professional approach, I would definitely recommend Ainscough Training Services." "Very well organised and a very good Assessor and I would definitely recommend Ainscough Training Services". "I have recently attended your crane A60 crane course, I passed my theory and practical. Joe my trainer was fantastic, he was very patient and super knowledgeable he made me feel very comfortable from the first day. His training is first class. I would also like to thank his dad Dave (who acted as the Slinger) who also amazing, they both did everything they could to help me through the experience. My examiner was Paul Dunn who again was fantastic made me feel at ease even though it was an exam. Lastly I would like to thank all the girls in the office, they too were excellent. Thank you all so much". Joe Lawrence was very informative, was clear and concise as well as being friendly and approachable. He did his best to fit in around our busy schedules without intruding into daily issues. Supported us at all times. More than helpful. Always polite , a good asset to yourselves without a doubt. I found the Assessor Joe Lawrence to be very helpful and easy to talk to and he put me at ease when doing the assessment, the first of this type I had done. I felt that the whole process was painless with Ainscough I would use you again for any further training I needed. I've done my Appointed person training , crane supervisor testing & my NVQ level 5 diploma with Ainscough Training Services. From start to finish & beyond the training company are by far the most professional & efficient I've experienced, I can honestly say you're trained & tested by the most professional instructors/testers in the crane industry All support staff go above & beyond & also genuinely care about the students getting the best training & support in achieving the NVQ & achieving their qualifications. I've started my own company on the back of my own experience & also of an excellent foundation of knowledge & training from Ainscough Training Services. I was a complete novice and had no experience in slinging/signalling and I passed both Slinger tests with no problems at all with Ainscough Training Services.My trainer was excellent at teaching me the information I needed to pass this course for both practical and theory tests, my tester was excellent too; very fair. In my opinion the course was excellent and cannot fault it at all. I would certainly recommend Ainscough to anybody wanting to do the same course I did. Thanks again. As always the course was a thoroughly enjoyable and informative experience. I have undergone training at ATSL previously and have always found your staff friendly, knowledgeable and approachable.The training environment is relaxed and welcoming. The Instructors share a wealth of knowledge from personal experience within the lifting industry. Special mentions to Dale who is an A1 trainer and Steve who manages to relax testing candidates with his manner whilst still being rigorous.I would have no hesitation of recommending ATSL to anybody.Im already looking forward to the next time. Thank you for all the assistance you and your colleagues have given Carsten and myself in arranging the AP course. We both enjoyed the course and Garys Knowledge and delivery of the subject was excellent. May I just take this opportunity to thank your colleague Owen for all of his help through this training, he was extremely helpful and made the whole thing an enjoyable experience. High quality training, knowledgeable Trainers and Assessors.The Assessor was helpful and knowledgeable of the process and technical aspects of the assessment. The Assessor was very knowledgeable, he made me feel at ease and was able to put the questions forward in a way that was easy to understand. I would recommend Jim the Assessor I had to anybody. Owen was very professional and courteous throughout the entire NVQ process. He kept me informed and on task with me finishing my NVQ. During our NVQ assessment, he took his time, and did not rush the process.The administrative process was easy and straight forward, with courteous and pleasant staff to work with. I would highly recommend Ainscough, and will be looking at using them soon in the future. Excellent course, very clear and learnt a lot, the instructor could not do enough for everybody, very friendly and approachable. I would just like to say thank you for an excellent weeks training at your training centre. The facilities and my trainers Steve and Mike were excellent and I look forward to contacting you in the near future to book further courses such as the AP ticket. I would like to take this opportunity in thanking Graham & Steve for sharing their knowledge with me and enabling me to pass this course. Their delivery of the course content and their attitude was nothing but professional. The course has now given me chance to better myself at Marsden Crane Services. I would like you to pass on my sincere thanks and gratitude to these two individuals and also express my thanks to the staff behind the scenes, well done to one and all. The Instructor and all the staff could not do enough for me.The Instructor was superb and had a high depth of knowledge. The overall experience from the initial enquiry,to the booking process and the course, were delivered to the highest standard. The training centre is modern, clean and a great learning environment. I will definitely be using Ainscough Training Services again. I really enjoyed the AP course, it was very intense, but I believe that it has to be. Obviously you have a very experienced and capable instructor in Jim and this was apparent throughout the course. All in all a first class experience, I suppose the biggest compliment I can give is that I will be using ATSL from now on for myself and my own staff whether it is Slinger Banksman or the Crane Supervisor or Appointed Person courses. The training facilities are excellent and I will definitely be looking into other courses Ainscough Training Services can offer. I cannot speak highly enough of Graham, he is extremely knowledgeable, friendly and approachable, always willing to answer questions and give sound advice.Richard the MD took time-out of his busy schedule one Friday morning to provide me with a brief overview of the requirements of the AP NVQ qualification.From initial registration, through induction and beyond. I found the course a most enjoyable experience. Thank you, A most professional approach at all stages. I wasn't happy with my previous training provider and moved to Ainscough Training Services based on other peoples experience and their reviews.They were very quick and efficient and always keeping me up to date with the progress of the NVQ at all stages. I had a very competent and knowledgeable Assessor and everything was done very well, thank you. A fantastic training facility, good people, good food and welfare facilities. I am recommending you to friends of mine within the armed forces community. Credit has to go to the Trainer Gary who was able to get the information across in such a way that you were able to retain it. We thought the facilities and the refreshments were excellent. Once again an excellent course. The competence and motivation that Ainscough Training has developed in our lifting teams is exemplary. When we lift something at Sunseeker, we are lifting someone's dream and the competence of our lifting teams is market leading within the yacht & boat building industry. Ainscough provide Assessors and Trainers that reflect the core values of Sunseeker, they are a genuine organisation who do what they say they will do. I cannot praise the training centre enough. The facilities were top class. The work the instructors put into the training as a group and individually was phenomenal. All the staff made me feel welcome from the first day I walked through the door. The encouragement I received from Graham, Steve and the crane driver meant a lot to me. I would like to pass on my thanks to Jim who ran the course, he did a great job! Thanks to all at Ainscough Training; the premises and the training provided was first class. The course details plus the whole lay out of the training was excellent,Garry, the trainer was probably the best tutor I have learnt with; his experience on all aspects of this course was clearly demonstrated to all. The trainer was very knowledgeable, pulling on his practical experience and sharing with us. It was never too much trouble to go over any points that where not understood.The training venue is excellent with plant and accessories on hand to explain any practical issues. The trainer was very competent and supportive.The venue was comfortable and well equipped, I would definitely recommend this company. Very good instructor, made things clear. The training facilities were excellent,great food and very clean and tidy. I would definitely recommend Ainscough Training and I wouldnt hesitate to return. A very helpful and supportive company. Ainscough Training Services have supported me through the whole process; from our initial meeting at the TATA Steel Works Job Fair, to introducing me to interview opportunities with a local crane company. Everyone has been very supportive, helpful and friendly and I have thoroughly enjoyed my time at the training centre. I have been able to take advantage of the funding and achieve a CPCS card for Slinger & Mobile Crane and I am now ready to start a new chapter with a career that can effectively support my family. Steve Turner is a fantastic trainer, who knows cranes and lifting inside out, the pace of the course was spot on. The training facility was modern, warm and very clean and the staff were very helpful and friendly. I would definitely recommend ATSL, I thoroughly enjoyed the course from start to finish, it totally exceeded my expectations. The staff were very friendly and professional, the training facilities are very nice and modern and free parking is very handy. If I have to rate the course then I will give you 5 stars of 5 and I will recommend it to others. The instructor Steve had a fantastic ability to communicate what can be a difficult subject area, first rate facility and staff. What a fantastic course, from a professional organisation, who delivered the course content in a professional manner, via an experienced instructor who was more than willing impart his knowledge, experience and good humour, I would highly recommend your training establishment. A very enjoyable and comprehensive course, the instructor was very easy to listen to and understand. He provided everything I needed. The Instructor took the time to explain everything I needed and provided excellent and clear information. I would definitely recommend Ainscough Training Services. My Assessor Danny was very helpful and professional. I had more than enough time to gather all my evidence together to submit. Whenever I needed any advice or information Danny was very helpful and answered all my queries. The booking process was really simple and easy to understand.The customer service was very professional. Couldn't be happier with the way Dale handled my NVQ. He was friendly, informative and made me feel confident throughout. Everything was professional without being overly formal. The course was beyond my expectations, the staff were professional, knowledgeable and friendly with high quality facilities.I would definitely recommend Ainscough Training Services. Amazing environment,excellent value for money,all the staff very helpful. The instructors and staff where very knowledgeable and friendly, with first class training facilities. From beginning to end it was a pleasure to work with you guys. My Assessor was very helpful in deed, as was Claire with all the administration contact; always spot on. You always complete our training to the high standard we require. and I would definitely recommend Ainscough Training Services. The trainers are very knowledgeable,professional and approachable. The facilities were excellent and I would definitely recommend Ainscough Training Services. I would like to thank Ainscough and in particular Steve Turner for providing an exceptional course. His classroom manner was very professional, welcoming and friendly. I found that the scenarios that Steve took the class through prepared us not only for our practical assessment but provided a valuable reference for planning lifts outside of this course. Steve's relaxed and helpful approach put everyone at ease creating a natural learning environment. I will recommend Ainscough and Steve Turner to my colleagues and friends looking at becoming an Appointed Person. My Assessor was very helpful and professional.I had more than enough time to gather all my evidence together to submit. Whenever I needed any advice or information Danny was very helpful and answered all my queries. The booking process was really simple and easy to understand.The customer service was very professional. Everybody at Ainscough should be proud of what they do as its a very professionally run company.Its not often I cant find some small fault in the way something is delivered to me, be it a pie from Greggs, the sale of my flat or £3600 worth of courses. I can always seem to find something that I could do to make it that little bit better. With Ainscough training Im glad to say everything was delivered as promised. Thank you to Joe, Graham, Kenny and Keith for teaching me and helping out with the Slinging and Crane ops and yourself for my initial meeting through to sending my CV to Ainscough Crane Hire. Also the girls in the office for the course admin side of things. Everybody at Ainscough should be proud of what they do as its a very professionally run company. Thanks again for everything I will definitely recommend you to anybody leaving the forces or thinking about getting into the industry and I look forward to doing more courses with Ainscough training in the future. From beginning to end it was a pleasure to work with you guys. Danny my Assessor was very helpful in deed, as was Claire with all the administration contact; always spot on. You always complete our training to the high standard we require. The course was exceptional, with a trainer who knew what he was talking about, from experience, not just by the text books. Ainscough training are by far the best that I have ever been with and would highly recommend them to anyone who wants to study in lifting operations. Keep up the good work. Tim was extremely helpful and knowledgeable. He made the NVQ run very smoothly and was on hand to answer any queries I had during the process . I was very impressed with Ainscough Training Services. I thoroughly enjoyed the course. Mike was extremely helpful throughout and offered great assistance when it was needed, he is a true credit to Ainscough. Please pass on my gratitude to both Mike and Paul for such a well presented course. I got from the admin team helped make the whole process go smoothly. The course was very good and Garys knowledge of the subject was excellent. I dont think there was a question asked that he didnt know the answer to. The Trainer was outstanding; he had extensive knowledge and humour throughout which definitely helped the learning, the food and facilities were superb. This course exceeded my expectations. I would definitely recommend Ainscough Training Services; excellent training methods and I picked up a lot of information in just two days. Thanks also to Paul who put us all at ease on the day of the exams. A tough course but delivered by very professional tutors. I will have no issues in referring anyone from my organisation to Ainscough Training in the future. Thank you. Kind Regards. I would definitely recommend Ainscough Training Services as they are extremely competent people who run very effective and professional service. Thank you to all at Ainscough Training who assisted in my Training & NVQ Assessment. The instructor & Assessor were excellent. The admin process was spot on; everything was explained well, with all the information I needed and I really felt welcomed". The Assessor answered all my questions extremely well and gave clear information. The whole process had a very positive and structured approach. As I am sure you noticed, he is a very proud man and is working extremely hard to achieve his goals in life. If he passes tomorrow it will be a step in the right direction. Thank you for all the time and effort you gave to me prior and during my course. Especially to the instructors Steve & Dale and for all your help with the ELCAS process. It has been much appreciated and allowed me to enjoy and pass the course. I look forward to coming back and doing the Appointed Person course"
I enjoyed the course mainly due to the way it was delivered. The instructor made the information easy to absorb. I would definitely recommend Ainscough Training Services as you have fantastic tutors and facilities. Very good tuition and a well positioned training centre with excellent facilities. Tim Morgan my assessor was very professional and knowledgeable. The pace and control of the assessment made me feel relaxed, giving me the confidence to produce and answer all information required. Tim gave me support to help build all the required information, to produce all the evidence I needed and guidance for my Lifting Supervisors Statements. Tim made the assessment rewarding and has given me confidence to be a Lift Supervisor". The whole process was made simple with the support given in a polite and friendly manner. Tim Morgan is knowledgeable, enthusiastic and encouraging. He explained the NVQ process clearly And conducted the NVQ process very well. Gary was a highly knowledgeable and approachable instructor, he made the course content accessible to all. Very professional trainers with a vast experience in lifting operations. The training exceeded my expectations. I would not hesitate to recommend Ainscough Training Services as the staff make you feel at ease and help you reach your full potential. We covered everything I expected and more. The instructor was easy to understand. He had excellent knowledge and a good approach. Very good training facilities. An all round excellent service. Thank you." 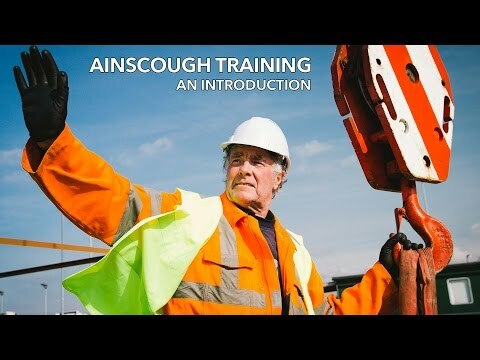 I have found Ainscough Training Services to be a professional, Knowledgeable and well organised training organisation. I would recommend them to colleagues and my own engineering team, and will use them again should the opportunity arise. Portsmouth City Council to Portsmouth International Port. Everything was 100% professional from the instructors to the admin team. I would have no hesitation in recommending your services to anyone. The Assessor was very professional and helpful during the entire process. I would definitely recommend Ainscough Training Services. Absolute gentleman, very clear relaxed approach, very informative, covered everything and more. Ainscough still the biggest and the best. You are a credit to British Industry. I have had excellent feedback from the two delegates who recently attended the CPCS Appointed Person course, from the venue to the course content and the Tutor. They were especially impressed with the Tutors teaching manner and impressive knowledge. The instructor satisfied the full range of abilities and needs on the course, with lots of advice and information for each individual candidate enabling them to relate to their area of use. I would definitely recommend Ainscough Training to others and would not hesitate to return for more training. I would like to give a big thank you to Tim Morgan the NVQ Assessor, he certainly put the candidates at ease and got through the assessment despite some challenging circumstances. My Assessor was professional, courteous and made me feel at ease throughout the entire professional discussion. He was very knowledgeable in all aspects and provided excellent feedback. The administration team cannot do enough for you. My thanks to Claire who was very courteous and always on hand to answer questions and emails promptly, making the NVQ process a pleasant and stress free. Ainscough Training Services is an excellent training body providing a top class service which I highly recommend. Dale Hoggan was constantly in touch monitoring my progress and supportive. He had understanding when I had areas of concern to discuss. He certainly went the extra mile to accommodate and gave tuition with accurate information to point me in the right direction". Very well delivered course, the instructors experience was very useful. I will be recommending this course to colleagues . I found my Assessor extremely approachable, thorough yet practical and very accommodating. I couldnt ask for any more. An extremely helpful and enthusiastic instructor, with absolutely brilliant clean & tidy facilities. Very intense but informative and enjoyable in a relaxed atmosphere and clean and professional environment. I have been on a lot of courses but this one seems to be on the top level of education, the instructor was very helpful and definitely knows his stuff. Gary is a pleasure to listen to, he explained all the information in detail without complicating it. Great food and facility. application questions and Tim the Assessor made my NVQ go very smoothly. A professional and cracking team!! I will be sending all our training requirements to yourselves in the future. The instructor was a great inspiration throughout the training. A perfect balance of theory and practical; a great course. Very good course instructors, very helpful and an excellent training environment. Excellent venue, excellent teacher & staff, Would highly recommend. Excellent instruction, very good adaption to the specific needs of the search and rescue environment. The instructor had knowledge, experience and management skills that were second to none. Excellent material, covered everything I needed to pass the course. company to prospective clients . A very good informative course that was delivered by an excellent instructor. The facilities were very good and clean. The instructor taught well through application of the rules/mode factors etc in the classroom then practical applications and personal experience. Thoroughly good course. The NVQ Assessor was a great help and made the assessment as stress free as possible. Very professional. Enjoyable and with the short space of time I had a learned a great deal. Gary was not only knowledgeable on the standard mobile cranes but also provided assistance, knowledge and resources relating to tele handlers, hiabs etc. Good handouts supported by a good trainer. Very good instructor; top of his game, clear method of instruction and very approachable. Steve was very helpful and always willing to answer any questions, the examples and the scenarios were very useful. The instructor made every effort to make sure we understood the material. Very intense but very rewarding. Excellent Mobile Crane course, delivered by an excellent experienced instructor, all staff made me feel welcome. Steve was an excellent instructor and shared his knowledge and experience to ensure maximum value to the trainees, the course was well put together by people with detailed knowledge and applicable experience. Overall an excellent course with the added benefit of easy access to and from the motorway! Very interesting and a lot of supporting practical examples with excellent handouts to take away and utilise in our own company. Enthusiastic and knowldgeable instructor who used his own experience to support the understanding of the subject. A very good course which provided the relevant skills and knowledge for my job. Excellent trainers! Well structured, good relevant information, the instructor was professional, patient, very experienced and supportive: Great teaching skills. Excellent course, very informative, friendly staff and instructors. I will be recommending our company use Ainscough Training Services for future training. The Slinger Signaller course was excellent, very interesting and I learned a lot. Gary and Duncan are very professional in the way they teach and do the testing. They both make you feel at ease. The training facilities were very good, both training rooms were very well layed out clean and tidy. I recently approached Ainscough Training to sort out some Slinger/Signaller NVQs. I had had a lot of trouble previously with other companies trying to get the training arranged. I sent Ainscough an email and that very same day they had sorted a trainer and put me in contact with him. A date for the training was arranged and everything was completed in good time. They were very helpful and efficient and answered all my queries. They will definitely be my first choice for this type of training. Very happy with the service overall. This message is to thank you and your team of trainers /assessors for the professional and supporting effort to make the achievement of the AP CPCS Blue card possible in less than 3 months. Also the flexibility in the Ainscough organisation in regards to planning training and assessing appointments is recommendable. "Very good course, the instructor had good practical knowledge and was never boring"! I found Tim to be an excellent NVQ assessor, he was able to show me practically what was needed with easy to follow instructions of what I was required to complete, in order for me to complete my NVQ. Tim always responded to my calls and emails in a timely manner. I was 100% happy with his support and guidance. there was also good practical information in the course handouts. new areas I needed to be aware of. The Course was very clear and concise, the instructor was very good at stopping to ensure all the class understood and answered any queries very well . The instructors experience of cranes was very important to the course. Legislation is constantly changing and its imperative our company keeps up with this. This has been a positive and informative process for all our staff that I have put through the NVQ assessment with Ainscough Training Services. They were able to suit the individual learning needs of each candidate in a timely and painless manner! Working with instructors that are very experienced in all aspects of crane work has been excellent and very enjoyable. I found all staff at Ainscough Training Services to be very helpful and polite. Steve is a great tutor with great knowledge of cranes. Excellent course I learnt a great deal from both the instructor and the course. I was very impressed with the service I received from Tim Morgan for my NVQ assessment, his knowledge support and helpfulness were exceptional. I would definitely recommend Ainsough Training Services as an efficient and effective training provider. In a nutshell it was a superb course that I found intensely interesting. I have used Ainscough Training Services ever since I started with the company and they have always been very helpful and knowledgeable. They help us identify what we really need. I would definitely recommend Ainscough Training to other businesses . Everything that was put to me on the course was done so in an excellent manner by the trainer. All was good and very enjoyable. Good; Instructor, very experienced, straightforward presenting style. Very good material made the assessment very straight forward. The course was well structured and delivered at just the right pace for all those who attended. It was clear from early on, that the instructor had in depth knowledge and experience of mobile cranes, and was able to relate the theory to practical examples throughout his working life. I was particularly impressed in the way he was prepared to go the extra distance to ensure that the candidates had a thorough understanding of any particular; subject. This was further supported by the ability to relate to practical studies based to the Ainscough organisation fleet of cranes and competent personnel.All in all it was a very enjoyable week. I have used Ainscough Training for many years and have always found them to be helpful, knowledgeable and friendly. We would not hesitate to recommend Ainscough Training Services to other businesses. I would like to thank all the people at Ainscough Training Services for their help during my AP course. A special thanks goes to my assessor Tim Morgan. Tim was fantastic from the first meeting to the last. Tim was always on the end of the phone or an e-mail and never failed to return a missed call. The help and advice given was excellent. I would highly recommend to anyone who is thinking of doing an AP course to select Ainscough. Ainscough Training Services meet our expectations as training provider, we are particularly impressed by their flexibility towards our training requirements. "The Instructorwas excellent, delivering the learning requirements whilst keeping the people engaged, a very useful course which has increased my knowledge of lifting operations." Very good, very well run course, With helpful friendly staff, very good learning and working areas. Mike was very informative and put every effort into preparing us, I feel I have taken a lot from this course that will stand me in good stead. Excellent Instructor, good knowledge, Gary had the ability to make participants feel at ease and provided guidance and coaching throughout. Very good course will be recommending to other staff. I found the experience of the course to be excellent, the instructors and all co workers were very helpful, warm and welcoming, this facility comes highly recommended by me. The NVQ Assessor was a great help and made the assessment as stress free as possible. Very professional. Enjoyable in a short space of time I have a learned a great deal. "Everything that was put to me on the course was done so in an excellent manner by the trainer. All was good and very enjoyable". Excellent and enjoyable course,all the instructors professional and approachable. "The Assessor was friendly and very informative.From start to finish it was a smooth and easy process.Great experience Contracts Engineer". Very well delivered course, the instructors experience was very useful. I will be recommending this course to colleagues. I found my Assessor extremely approachable, thorough yet practical and very accommodating. I couldn't ask for any more.